It’s late, and we’re too tired to break this down for you. But here is Evine’s Wednesday press release. MINNEAPOLIS, April 26, 2017 (GLOBE NEWSWIRE) — Evine Live Inc. (“Evine”) (NASDAQ:EVLV), a multiplatform video commerce company (evine.com), today announced the world-wide premiere of “Evoté Beauty,” the future of anti-aging skincare, on May 5, 6 and 7. Developed by Irena James, a prominent and highly respected instructor at UCLA Extension Cosmetic Sciences Program, and her husband Nik James, a third generation cosmetic ingredient manufacturer, Evoté challenges skincare industry norms by targeting the skin at night with breakthrough, patent-pending formulas designed to work with the body when the skin is naturally more receptive to accepting and working with age-defying nutrients. Evoté challenges the status quo of anti-aging by capitalizing on the 24-hour circadian rhythm and kinetics of the skin’s natural cellular process. Skin has its own rhythm, which Evoté refers to as the “cell clock,” and night is a time when the body rests, repairs and regenerates – both below and above the skin’s surface. The husband-wife co-creators designed Evoté to make the most of the skin’s nighttime shift by taking advantage of both cutting-edge ingredient technology and revolutionary research of the body’s normal process to restore vital functions overnight, a time when the skin’s barrier is more receptive to treatment. 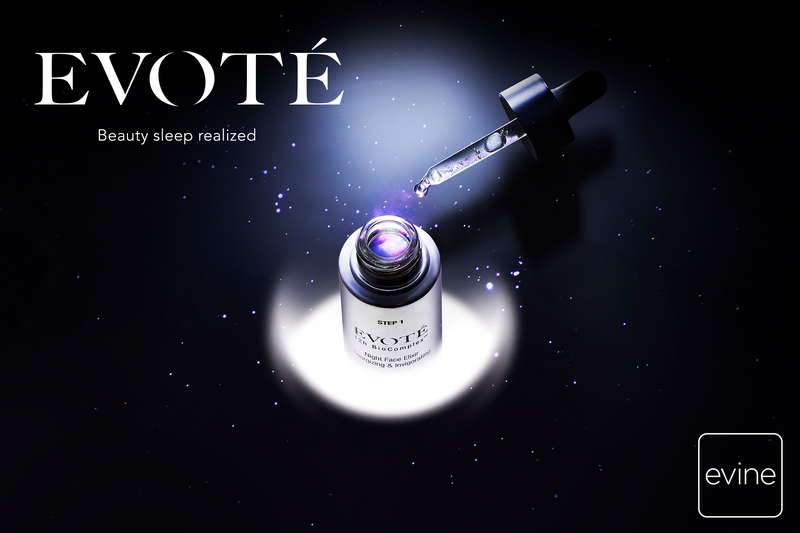 Differentiating itself from all other skincare brands, Evoté’s nighttime products feature the 12 HR BioComplex™, a patent-pending technology made with select actives, too fragile to be used during the day, but able to rejuvenate and resynchronize the skin’s appearance during nightly rest. Evoté also works by optimizing the skin’s natural nighttime functions of restoration, detoxification, re-energization and replenishment. Complementing the nighttime product line, Evoté’s daytime products include the proprietary White Carbon Complex™, which focuses on shielding the skin’s outer layers from environmental contaminants with purifying and brightening properties to make dull skin appear more radiant. Irena’s influential work is prolific in the world of skincare research, product innovation, and protocol development, which created the groundwork for the core scientific principles behind Evoté. A prominent instructor at UCLA Extension and around the globe, Irena has educated thousands on the latest in skincare innovation and discovery of cosmetic ingredients for more than two decades. Her husband Nik has a keen insight into all aspects of skincare manufacturing, development and research and is son to one of the world’s most prominent award-winning cosmetic ingredient experts and published skin care researcher, Rebecca Gadberry. Evoté debuts May 5 at 12pm and 11pm, May 6 at midnight, 3am, 6am, 8am, 11am, 3pm and 8pm, and May 7 at 12pm ET. Wednesday was a big day for home shopping news. Wig purveyor Toni Brattin, who was on HSN and then went to Evine, announced on Facebook that she is heading to QVC. We guess we really shouldn’t have been surprised when we checked our email Wednesday and saw the press release that HSN CEO Mindy Grossman was leaving the home shopping network for another gig. Over the years she has been mentioned as a candidate for a number top jobs, including Avon. But her landing at Weight Watchers International Inc., where lifestyle guru Oprah Winfrey is now queen, was quite a surprise. But it seems like a pretty smart move to hitch your wagon to Winfrey, without a doubt. So good for Grossman. And threw in her two cents. “I am thrilled to join Weight Watchers and lead the next phase of the company’s transformation,” she said. There have been a zillion stories crediting Grossman with taking HSN to the next level, by bringing in name brands and vendors who gave the network a cachet. On the other hand, her strategy alienated many long-time HSN fans. and home shopping channels have seen their revenue drop in the face of a tough retail environment. Grossman’s resignation will be effective on May 24, 2017, and she will not stand for election to the Board of Directors at the Annual Meeting of Shareholders on the same date. In the interim, she will work with senior management and the Board to ensure a smooth transition. The Board has retained a national search firm to assist with the search for a successor that will include both internal and external candidates. In addition, the Board has established the Office of the Chief Executive whose members will manage the company’s day-to-day operations and engage with the Board on a regular basis until a successor is named. The Office of the Chief Executive will consist of Rod R. Little, Chief Financial Officer; William C. Brand, Chief Marketing Officer of HSNi and President of HSN; and Judy A. Schmeling, Chief Operating Officer of HSNi and President of Cornerstone Brands, Inc.
“I’m extremely proud of what we’ve accomplished at HSNi and believe that the company is well positioned for the future. It has been an honor to work with such an inspired team over the past decade as we transformed the business to lead the future of boundaryless retail. With a focus on customer engagement, digital innovation, product excellence and immersive and community-oriented content, HSNi will be able to thrive in the modern retail environment, where consumers are looking for experiences and meaning,” Grossman said. OK, we’ve never heard of it, but MacKenzie-Childs is bringing a handcrafted home collection to Evine. The press release on Monday said that “the classically quirky home décor brand” will bring “MacKenzie-Childs Home TV” will be on Evine with mucho air time on May 3 and 4. You can expect “a peek into a brand which has been creating whimsical and unique designs since 1983,” according to the press release. “There is something special about the magic of MacKenzie-Childs,” Evine CEO Bob Rosenblatt said in a canned statement. “MacKenzie-Childs has an amazing and colorful story to tell, and Evine is the perfect canvas to share our story live with our fans,” said Rebecca Proctor, on-air guest and creative director of the company..
“MacKenzie-Childs Home TV” will feature some of the company’s best-known collections, including the Parchment Check, Morning Glory, Flower Market and Courtly Check patterns. You can expect hand-painted tea kettles, mug sets and creamer and sugar sets. In addition to the network take-over, the MacKenzie-Childs brand will interact with Beekman 1802 during their premiere, an Evine bath and body brand whose upstate New York farm is located near MacKenzie-Childs’ design studio. This week Evine is debuting a new vendor, Lindsay Soko, whose products will supposedly help you get your home organized. This we have to see. And here comes Evine CEO Bob Rosenblatt again. “You can’t help but be excited for what Lindsay Soko can bring to our customers,” he said in a canned statement. “There’s a real joy in simplifying your life,” she said. Accessory Stax – a hanging vertical organizer for storing scarves, jewelry, handbags and other accessories. Shoe Stax – a solution which accommodates two pairs of shoes into the space of just one. Boot Hanger – created to fit any closet and designed to protect, store and organize boots. Boot Snugs – suspenders for pant hems, Boot Snugs keeps pants tucked inside boots. Any Wear-it Wallet – a garter-style wallet that allows women to tuck their important cards, identification and cash inside their boots or around belt loops. For the third consecutive year, QVC is teaming up with NBC’s “Today Show” for Today’s Next Big Thing, a national competition “to honor the spirit of innovation and invention and discover one entrepreneur whose product has what it takes to be presented on QVC’s highly engaging multiplatform shopping experience,” according to a press release last week. Via the competition, next Saturday an aspiring entrepreneur will be given their big break: a chance to sell an invention in front of more than 100 million households. In January inventors across America were invited to submit their products for consideration. Starting this week nine finalists — with inventions spanning beauty, fashion, home, and cooking and dining — will appear live on “Today” to pitch their products to a panel of judges. The panel includes Anna Baker, QVC’s director of global merchandising; Jill Martin, “Today” contributor and creative director of G.I.L.I. got it love it , QVC’s contemporary fashion and accessories line). Starting Tuesday viewers will vote for their favorites on TODAY.com. And on Friday the three inventors with the most votes will have one last chance to convince the judges that they have what it takes to be on QVC. The judges will declare the winner, and the winner will sell his or her product live on QVC the next day, Saturday, April 22, at 10 a.m.
“Each time we have teamed up with NBC on Today’s Next Big Thing, the response from our customers to the winning entrepreneur has been tremendous,” Baker said in a canned statement. Prior winners of Today’s Next Big Thing quickly sold out during their first QVC appearances. In 2015 Leslie Pierson won with GoodHangups, a reusable magnetic display systems for posters, art, photographs and more. In 2016, Krista Woods won with Glovestix, a portable odor-management solution for athletic gloves, shoes, cleats and more that sold out in just eight minutes. “Winning Today’s Next Big Thing and appearing on QVC has been an absolute surreal experience,” Woods said. Kudos to QVC for its diamond event on Thursday, where the home shopping network fully committed to disclosing and discussing the color and clarity of the stones used in its jewelry. We have long complained that QVC would describe its Affinity Diamond pieces as being colorless or eye-clean but not say whether they were H-I or whatever. The No. 1 home shopping network in recent months began releasing that info on some of its diamonds, but in its event this week it really went into color and quality for nearly all is jewelry. And QVC not only offered its TSV rings in 14 karat gold, there were a smattering of pieces where for the first time the network set its diamonds in 18 carat gold! Were these baubles cheap? No, we like seeing higher quality goods. And QVC’s Peyton Kelley did a nice job of explaining what the various color grades on a diamond mean. 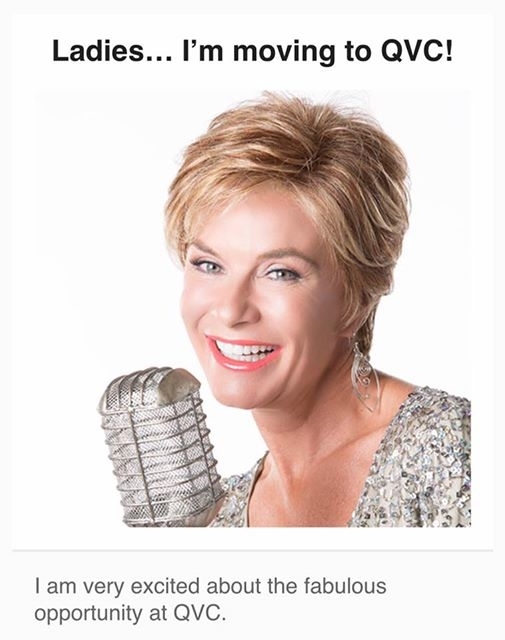 Will Your Too-Frank Obituary Mention QVC? Is being a QVC customer an “endearing foible”? It is according to The Wall Street Journal. The broadsheet on Thursday in its so-called “A-Hed,” or Page One feature story, wrote about how obituaries today are not depicting the deceased as angels when they were alive. The top of the story talks about the obit that was written about an Oregon plant manager, Wayne Brockey, by his grandson. And??????????? Is that a crime? The story goes on to quote Brockey’s grandson, who penned the obit, as saying that his family always joked a lot. “So it made sense to mention his grandfather’s endearing foibles,” according to the Journal, i.e. shopping at QVC. Yikes! What happened to not speaking ill of the dead? HSN will release its first-quarter earnings May 3 at 8 a.m. before the market opens, the network said on Wednesday. CEO Mindy Grossman and Chief Financial Officer Rod Little will hold a conference call at 9 a.m. to review the results. Those interested in participating in the conference call should dial 877-307-0246 or 224-357-2394 at least five minutes prior to the call. There will also be a simultaneous audio webcast available via the company’s website at http://www.hsni.com. A replay of the conference call can be accessed until May 17 by dialing 855-859-2056 or 404-537-3406, plus the pass code 4007861 and will also be hosted on the company’s website for a limited time. Liberty Interactive Corp., parent of QVC, will post its first-quarter earnings on May 9, the company said on Tuesday. President and CEO Greg Maffei will host a conference call to discuss the results at 10:30 a.m. Following prepared remarks, the company will host a brief Q&A session when management will accept questions regarding both Liberty Interactive Corporation and Liberty TripAdvisor Holdings. During the call, Maffei may discuss the financial performance and outlook of both companies, as well as other forward looking matters including the proposed acquisition of General Communication Inc., its combination with Liberty Ventures Group and the subsequent split-off of Liberty Interactive’s interest in the combined company, GCI Liberty. Call ReadyTalk at (844) 307-2219 or (678) 509-7635 at least 10 minutes prior to the call. In addition, the first-quarter earnings conference call will be broadcast live online All interested participants should visit the Liberty Interactive website at http://www.libertyinteractive.com/events to register for the web cast. Links to the press release and replays of the call will also be available on Liberty’s The conference call and related materials will be archived on the website for one year after appropriate filings have been made with the Securities and Exchange Commission. You are currently browsing the Homeshoppingista's Blog By Linda Moss blog archives for April, 2017.